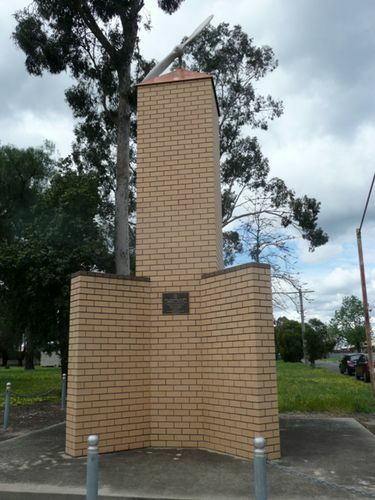 A monument commemorates members of the Royal Australian Air Force Memorial who served in No 11 Elementary Flying Training School during World War Two. The members of the No.11 E.F.T.S. Committee wish to express their thanks for the assistance received from organisations and individuals in the construction of this memorial and in particular Tattersall's for their donation to construct. No. 11 Elementary Flying School occupied the Benalla Aerodrome from 1941 to 1945. During the Second World War. Benalla was an important training establishment in the British Empire Air Training Scheme. During its operation 2953 young pilots trained in Tiger Moth aircraft before progressing to advanced training in fighter and bomber aeroplanes. These pilots served in all theatres of war, many never to return. This memorial is dedicated to the memory of these pilots, the instructors, administration and ground support staff.